This is a picture I took while in Jamaica Plain, Mass. 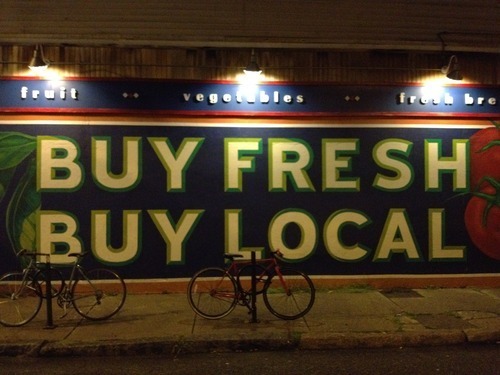 Buy Fresh and Buy Local. What if every coffee shop in Philly bought fresh and bought local? Would shop owners isolate themselves by doing this or get to know their neighbors better? Maybe quality of life would increase? Whatever the outcome, it appears to me that more places in Philly, particularly coffee shops because of their unique position could adhere to the principle Buy Fresh Buy Local. Fresh, locally roasted coffee is the best! Coffee shops, especially the the good ones offer fresh fruit, fresh sandwiches all of which for the most part is locally sourced. Why doesn’t this tie out with their coffee? Coffee roasted fresh, often times to order, locally in Philadelphia has a big impact on the happiness of customers, happiness of shop owners and the betterment of Philly, and in that order. I’ve thought a lot about it and come to realize that many times, like in this case, the anwer is usually a simple one! Buying Fresh, Locally roasted coffee is a good move, if you know how to move that is. It’s 9:48 at night so I can’t drink coffee right now, but I damn sure will be drinking it in the am.